I found out by accident this afternoon that it’s International Beatles Week, so it is of course exactly the right time to announce the imminent re-release of The Beatles’ film “Magical Mystery Tour“. It has been restored, and remixed 5.1 and stereo soundtrack. 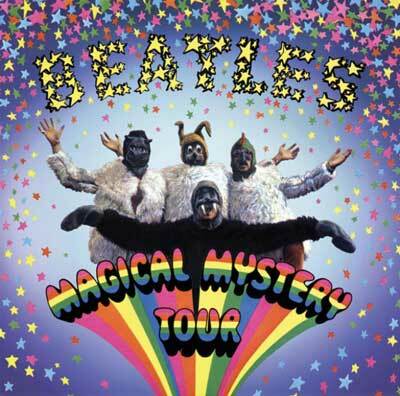 Yes, the Beatles’ third film, “Magical Mystery Tour” is set for a worldwide release on October 8, on Blu-ray and DVD. It will even, in the United Kingdom, United States, Canada, Australia, Italy, Japan, and other countries, from September 27, see a short run in cinemas. A similar tactic coincided with the release of the Martin Scorsese documentary, “George Harrison: Living in the Material World“. If it is a similar length run get in there quickly, as George’s doco had a very short run indeed. Click the thumbnails below to be taken to larger versions of the images. On the Blu-ray and DVD there’s of course the restored film, unseen footage, new interviews with Paul and Ringo, and a directors’ commentary track, that director being one Paul McCartney. Magical Mystery Tour came on the back of, in my opinion, THE golden era of The Beatles, following the best 1,2, 3 album punch of all time, with “Rubber Soul”, “Revolver”, and “Sgt Pepper’s Lonely Hearts Club Band”, and one very good film and one less good film, “Hard Day’s Night” and “Help” respectively. “Magical Mystery Tour” was not very well received, considered a misstep and over-reach by critics back in 1967.